NHK and several vendors, like Hitachi and Ikegami, have been working on 8K equipment development for several years. While 4K and UHD TV will clearly dominate the conversation at the 2015 NAB Show, Japanese National Broadcaster NHK continues to push the envelope with on-going development of 8K resolution technology (that’s 24 GBps of throughput). The broadcaster, and manufacturers like Ikegami which are supporting it, apparently are banking on an IP future that is resolution independent. Early in 2014, Nippon Hoso Kyokai (NHK) Science & Technology Research Laboratories conducted a test from its bureau in Hitoyoshi, Kumamoto Prefecture, in southern Japan, and sent the 8K Ultra High Definition TV signal to a receiving station more than 16 miles away using a single UHF channel. This followed an earlier test in May 2012, when NHK “broadcast” the world’s first successful terrestrial signal in 8K to a point about 26 miles away. The broadcaster has been recording sports and other events in 8K with the goal of getting those signals into consumers’ households in the future. At the 2015 NAB Show this year, NHK (Booth #N8933) will once again host demonstrations of the technology and the practicality of broadcasting it over the air. This will include the showcase of a 22-channel audio mixing console to complement the high-resolution images. Ikegami will also showcase the technology in its exhibit booth (#C7725), as it did last year. Ikegami Tsushinki has collaborated with Japan Broadcasting Corporation (NHK) to develop a range of 8K UHDTV products, including a studio camera and handheld camcorder. Also on display at Ikegami will be a 4K Technology Exhibit that will include a new 2/3-inch CMOS 4K camera and also a new 4K base station, compatible with existing Ikegami’s line of Unicam cameras. As part of this 4K exhibit, Ikegami will display Hibino Corporation's “real-dot” full 4K 293-inch LED display. The company said the combination of Ikegami’s precise imaging technologies and Hibino’s high-resolution display technologies will allow customers to expand the potential of the 4K solution. 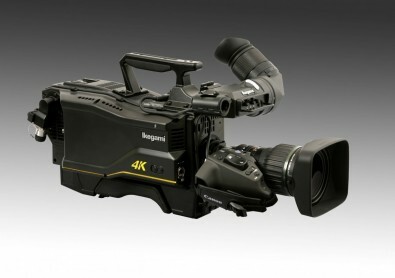 At NAB Ikegami will show its new HC-HD300 Handheld 4K Camcorder. Some of the other systems on display will include the newest addition to Ikegami’s Unicam HD product line, the HC-HD300. It’s a highly flexible, docking style camera that represents Ikegami's first affordable HD studio camera system. Designed for the studio or field, it features a newly developed 1/3-inch 3-CMOS optical block design. Ideal for broadcast TV stations, as well as, educational, corporate and house of worship applications, the Ikegami HC-HD300 also works in conjunction with a newly developed camera control system consisting of the FA-300 Fiber Adapter and BSF-300 Base Station (utilizing OpticalCON DUO connectors for its fiber camera cable connection). This connector accepts either a mating OpticalCON Duo connector for SMPTE hybrid camera cable (maximum distance: 250m/820ft), or common optical LC connectors for duplex single-mode fiber cable (maximum distance: 10km/32,800ft). The system enables affordable and flexible integration for a variety of applications. The new HDK-65C is the latest addition to Ikegami’s Unicam HD line. Equipped with Native multi-format 2.5 million pixel, 2/3-inch CMOS sensors, the HDK-65C is available as a single-format system, and is software-upgradeable to additional HD formats. Providing end-to-end digital processing, it features a low-profile docking camera head for fiber, triax, or wireless applications. Of note: At the NAB Show Ikegami and other vendors will demonstrate how CMOS sensors are now meeting and exceeding the performance of CCDs in sensitivity, signal-to-noise ratio, and resolution. They continue to offer low power consumption, no vertical smear, and a high degree of format flexibility. With extensive ongoing research and development in this technology, the adoption of CMOS for broadcast camera use is now the trend. As such, we’ll see new 3-chip studio/live production cameras from Grass Valley, Ikegami and Sony.